Valencia consists of 3 provinces having a wide rang of industries, of which tourism is the most important though locally the production of fruit, vegetables and rice are also important. The province of Alicante includes the Costa Blanca, the best known resorts of which are probably Torrevieja in the south, and Benidorm to the north. There are a host of sport and leisure activities to entertain the tourist but not as many golf courses as found on the Costa del Sol. Alicante can be accessed by Alicante Airport. Alicante city has a fast train service connecting it to Madrid and is connected to Valencia, Castellon, Tarragona and Barcelona by the fast Euromed service. More Information on Alicante Province, it's Towns and Villages. We have self catering holiday rentals in Alicante in or near the following towns. Valencia province is famous for the production of oranges and rice with the helpof irrigation on the plains between the coast and the mountains. The city of Valencia has some impressive modern architecture at the Arts and Science Park while the Albufera Natural Park lies immediately to the south. Valencia can be accessed by Valencia Airport. Valencia city has a fast train service connecting it to Madrid and is connected to Alicante, Castellon, Tarragona and Barcelona by the fast Euromed service. More Information on Valencia Province, its Towns and Villages. 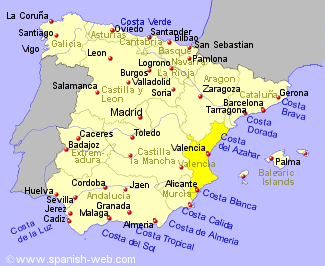 We have self catering holiday rentals in Valencia in or near the following towns. This, the most northern of the provinces of Valencia is noted for the orange groves covering a large area along the coastal region giving rise to the name the Orange Blossom Coast or Costa del Azahar. There are sandy beaches and rocky areas without too much development. Castellon city is connected to Alicante, Tarragona and Barcelona by the fast Euromed service. More Information on Castellon Province, its Towns and Villages. We have self catering holiday rentals in Castellon in or near the following towns.